A project to create a living and digital legacy to remember the sacrifices of footballers in World War One has been launched. England and West Ham legend Sir Trevor Brooking is spearheading an appeal to plant trees to commemorate football's involvement in the 1914-1918 conflict. The idea is to dedicate a grove at the World War One centenary wood near Epsom, Surrey to each league team. A digital archive will also be created at the National Football Museum. "There were 60-70 teams whose players who fought in war," said Sir Trevor. "The link was always there. "Football is the national game and in conflict like that, people look for something to bond together. "At the Battle of the Somme they actually kicked footballs sometimes when they went over the top, out of the trenches. "And there was the Christmas truce where soldiers from Germany and Britain had a game of football." Bradford Park Avenue player Donald Bell was the first English professional footballer to enlist in the British Army. He was awarded the Victoria Cross for his actions on 5 July 1916 at Horseshoe Trench on the Somme. He was killed in action on 10 July 1916. Walter Tull was one of England's first black footballers, playing for Tottenham Hotspur and Northampton. He became the British Army's first black officer and was killed in action leading his men into battle on the Western front in 1918. The National Football Museum is working with The Woodland Trust on the For Club and Country project. 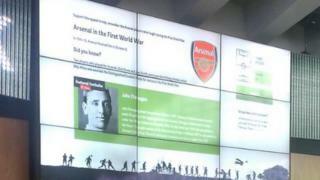 As well as planting trees at the Langley Vale wood, a digital archive of each team's links with World War One will be created at the museum in Manchester. "Every football fan needs to get involved and make sure their club is remembered in the football groves at Langley Vale Wood," said Sir Trevor. "If you love football as much as I do, please get your team represented and see your own name listed on the supporters' roll of honour."